View Cart “Pure Physique” has been added to your cart. Bulletproof Bodies has taken the globally popular physical training method of body-weight exercise and created a targeted, functional and multi-muscle approach to developing physical resilience. From tennis elbow to low back pain, Bulletproof Bodies aims to both prevent injury and to rehabilitate injury through improving the health of muscles, tendons, ligaments, and joints. As an added bonus these simple body-weight exercises can help to increase muscular strength and fitness. SKU: LP67894. Categories: Training, Health & Fitness, Fitness. Tags: body weight exercise, good health, injury prevention, physical resilience, physical training. Whether you are a highly-tuned athlete looking to stay at the top of your game, a return-to-fitness enthusiast with new aches and pains, or a moderately active individual keen to overcome that recurring joint pain, Bulletproof Bodies can help you with your physical goals. This book can also help you to better understand your own body by teaching you the need-to-know anatomy in health and injury. The body-weight exercises will engage multiple body areas and muscle groups to offer a time-efficient, challenging, and accessible method for dealing with those niggling injuries. Bulletproof Bodies is the result of a partnership between a chartered physiotherapist and a calisthenics expert who have long appreciated the use of body-weight exercise in developing physical resilience to the strains of modern living. Ross Clifford is a UK-registered and chartered physiotherapist with a life-long interest in human movement and function. He is enthusiastic about the promotion of exercise and physical activity for health, and draws on his knowledge of sport and exercise science to supplement his therapeutic approaches. As a lecturer in physiotherapy, Ross strives to convey technical information in a clear and accessible way to his students, patients and readers. Ashley Kalym is a UK-based writer who has a long history of using and promoting body-weight exercise. Getting the fitness bug at a young age, he has experienced physical training in many disciplines, including calisthenics and gymnastics, Olympic weightlifting, and even a short stint training in the Royal Marines. Ashley has also written Complete Calisthenics The Ultimate Guide To Bodyweight Exercise, also from Lotus Publishing. 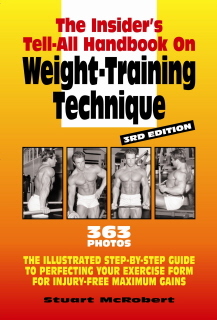 The Insider’s Tell-All Handbook on Weight-Training Technique Revised 3rd Edition is the latest of this classic title and provides the most thorough, safety-minded, practical, up-to date, detailed and illustrated book on exercise technique.